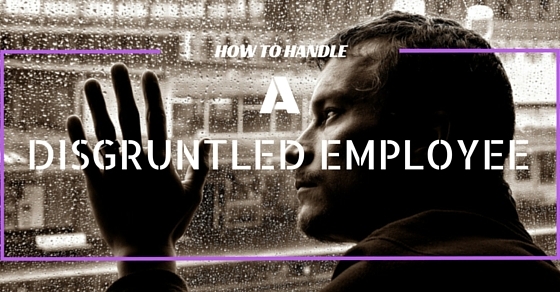 The meaning of the word ‘disgruntled’ basically means angry, displeased or discontented with something and the ‘employee’ is a person working in an organisation. So a ‘disgruntled employee’ is a person of the organisation who is not satisfied in the firm and is angry on something or someone. Dealing with disgruntled employees in every firm who are disliked by managers and don’t want to have them in their firm. When such kinds of disgruntled employees are present in the work environment they spread a feeling of negativity among the other employees in the office and often start complaining regarding things not going in their order in the office. They do not motivate or encourage others in the office to complete the tasks on time and do not let things done on time in the office. If the other employees see that the management itself is allowing such unhappy employees, they are more likely to get into acting in the same disgruntled manner in the workplace. So it is important for the management to discontinue in spreading this negativity in the workplace so that everyone can act in an appropriate and a disciplined manner in the office. The following mentioned are few HR issues that help in managing difficult employees. It is recommended for the management that they shouldn’t come to a complete conclusion immediately without knowing the entire story in the office and should make a decision based on certain assumptions and not knowing all the facts. They should really first understand what is going on in the head of the individual and see how their behaviour is. Always gather all sorts of information regarding the workplace if it refers to something that the individual is upset for with the company and do not ignore them and show a caring nature towards the person. At once when the management identifies that something is wrong in the workplace with one of their employees they shouldn’t ignore it. When the problem is at the minimum level, try and solve it at once rather than letting it turn into an even bigger problem. If it leads to a bigger problem then this same anger and negativity that the one employee would have, spreads among all the other employees which turns the entire workplace into negative and makes the other employees upset too. When the manager realizes that an employee of the firm is acting in an angry way in the workplace then they will be tempted to scream at the person but the manager should know that it is not a good attitude by them, as it may not solve the problem completely. The manager should stay calm whether the problem is personal or impersonal to the manager and shouldn’t lose their cool. The manager should even not get angry on the situation or else the employee will realize that they are doing it on purpose which tends them to get even more angry. The management needs to explain it to the employee that the attitude they are showing in the workplace is not at all acceptable by anyone. So while explaining this to the employee the manager should always explain everything in a clear manner so that nothing is misunderstood by either of them. The conversation needs to be genuine in nature like that of a conversation between a manager and an employee and it has to be effective in nature. If the employee is having any kind of problem then offer them support and guide them well so that the problem is solved. The employee may be angry and acting in an upset way cause the office environment is very hot everyday whether it refers to the temperature or the tension given by the boss. So the manager should realize this and always keep a cool head while they solve the problem. If this doesn’t help then give the employee their personal space so that they can try and calm down their anger as these kinds of employees might need their own time so that they are comfortable enough to calm themselves and then act in a professional nature with the boss. The boss or the manager mainly has the mentality to shout or yell at the employee in front of all the other employees. But this isn’t the right manner to solve the problem as it may further embarrass the employee and make them even angrier in public. So the company in turn will also not benefit as the employee is behaving in this manner which will affect the productivity process in the company and so this kind of conversation should be done privately only between the people who concerns it. Most of this kinds of employees who have anger and a disgruntled attitude within themselves always tend to distract all the other employees in the office when they are carrying out their job. So the manager should know that when they are dealing with such kinds of employees, they need to ensure that all the other employees in the workplace aren’t getting distracted or affected in any way while they are doing their job. It always takes time for a person to either get angry at a level or also get calmed down for a while. So the manager should know that this doesn’t happen over a single event and should give the person time to calm down. Later on, after some days the manager can have a follow up conversation with the employee to see whether they have understood what had been discussed with them about their attitude in the workplace over time and it may have a positive impact on the attitude of the person. The manager does want to resolve the ongoing situation in the office and have the happy employee back as a member of the team for the future. So they need to keep records of certain discussions that they had with their employees just in case the issue gets worse. These kinds of records will help the manager in the future so that if such a situation comes back in the future, the manager can handle the situation in a better way and take the effective action. With respect to any kind of records maintained by the manager regarding an individual employee, everything needs to be kept confidential so that other employees or others do not get any files in their hand and come to know the other employees. Records regarding other employees should be maintained confidentially as there would be many factors relating to it and if gets to wrong hands, could effect the particular employee. It is always known that anywhere with great power comes great responsibility. But if the person has the power in control and has a bad disgruntled attitude in the workplace then they will not be responsible enough to carry out any kind of tasks in the office which will have a feeling of negativity in the workplace and amongst all the other working employees in the firm. Though the manager knows that they have to deal with one or some people who have such a disgruntling or negative attitude in the office, they need to further ensure that the other employees aren’t further affected and influenced by this negativity. So the manager needs to keep mentioning at all times positive things such as the purpose of the firm, its goals as well as its missions so that everyone at all time are reminded of all the bigger concepts of the office. While explaining the ongoing situation in the office, the person should never speak the side of the story that is regarding the employee which includes employee issues. The manager should give the employee time to talk what they feel isn’t going right in their favour even though the manager knows what the problem in the office is. Just let them know that there are certain complaints which the management has received and would like to discuss it with them. And never start going off topic but stick to the matter or situation at hand. Though the manager might have all the facts in front of them to come to a conclusion but it isn’t always sure that they will be 100% right at all times. So at times to come to an understanding, they might offer a concession so that everyone is happy and the manager looks understanding in the view of the employee. With this, the person may realize that they are wrong and may try and change which can benefit the firm for the future. It is always expected that while the manager is gathering most of the facts relating to the matter with the employee, they might get to know some rumours which are negative or while the employee is telling their part of the story to the manager they might mention certain rumours. So the manager shouldn’t bother even considering hearing these rumours as there isn’t any concrete proof regarding it. They must answer these rumours immediately in an accurate manner and counter the rumour without repeating it . When all the facts are gathered by the manager that a person is behaving in this manner in the workplace, they need to mention all their partner and allies as soon as possible so that even they have an idea as to what is going on in the workplace. Inform them as often as possible if it continues to happen so that even they can provide certain information towards providing solutions for the ongoing problems. Though this kind of situation has developed in the workplace which is unfortunate it doesn’t mean that everyone’s work should come to a stand still just because of one single individual. So the manager needs to know that all the action in the workplace isn’t stopped. So the manager needs to develop a number of different and unique plans and let the people know about it with which all the other employees may get a brighter picture regarding the future. Though it has been seen in the past that even in the workplace with disgruntled employees the company has and continues to have a great company culture. So every manager should take it as a challenge and continue to build a glowing reputation and a great office culture in the eyes of others, so that the company can have more investors interested in the company as the firm will keep on growing. So once the manager comes to know dealing with a disgruntled employee in the firm, they need to realise that if they have to let go the employee which will benefit the company then they should do so. It is not necessary that the company would stop running without one certain employee but it may stop functioning smoothly if they continue to have that same employee spread the feeling of negativity among the other employees. Sometimes taking such a measure would be the right thing to do, so that no further trouble is caused either to the workers or the management. A better person who is fully committed to the job might be available to carry out that same job in a better way which makes it a brighter prospect for the organization.